Joshua Culligan keeps his eye on the ball. 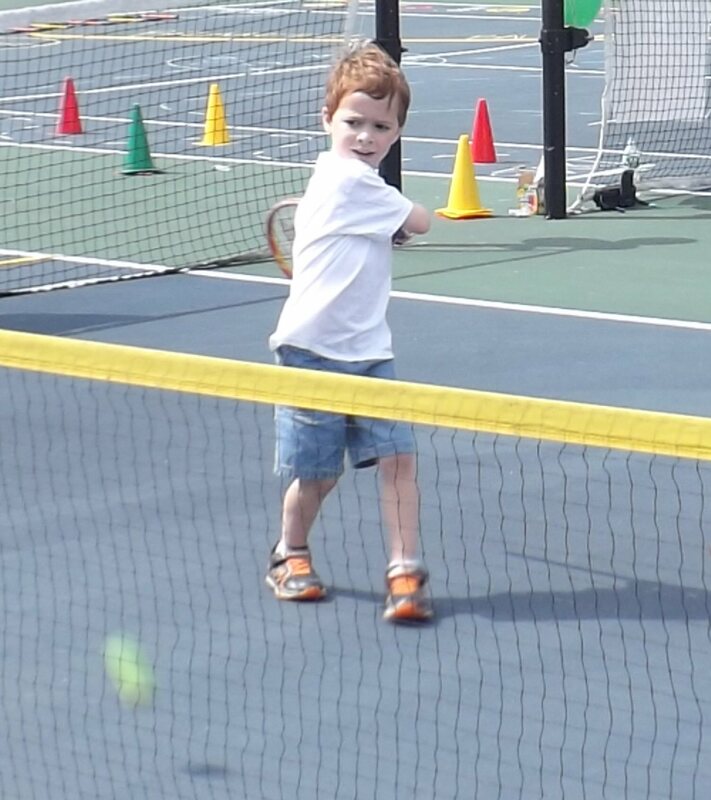 OSWEGO, NY – Dozens of elementary school age youngsters got to show off their tennis skills and win some neat prizes recently. 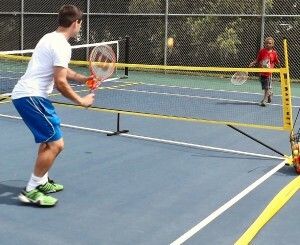 Shane Evans, USTA Summer Tennis coordinator, has his hands full returning volley after volley with a young tennis enthusiast. 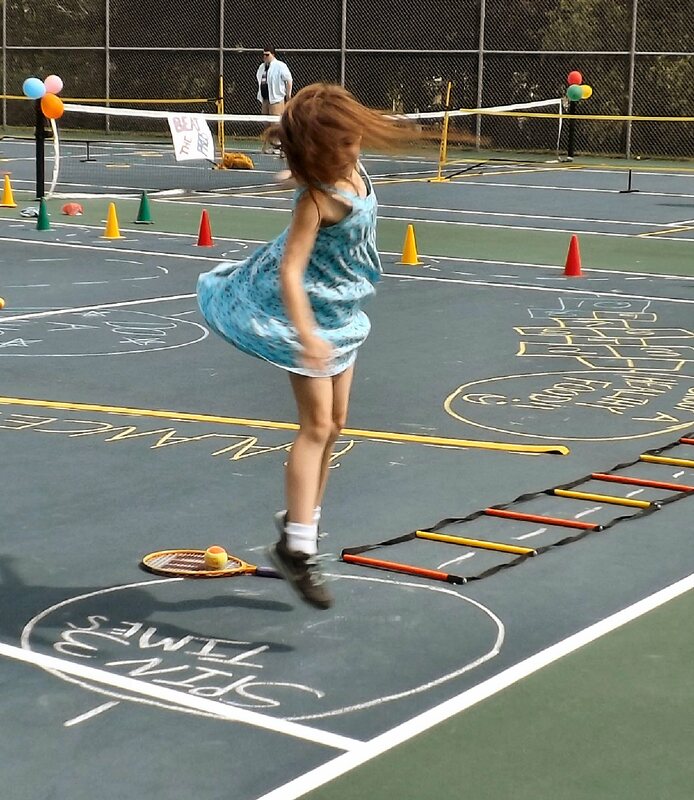 A USTA Tennis Program carnival was held at the Riley Elementary School tennis court. 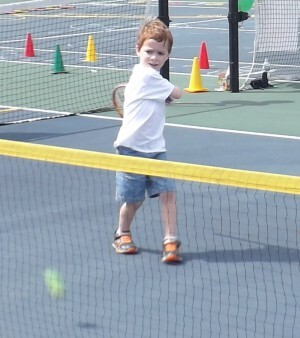 Nearly three dozen young tennis players stopped by the court during the four-hour event. Although the USTA Tennis Program started in 2006, this year was the eighth year for the Tennis Carnival, which began in 2007. It is run through the Oswego City-County Youth Bureau. A few years ago, they had around 20 participants. It was in the lower 20s in 2013 and the upper 20s last year. Some AmeriCorps members are working with the program. The Youth Bureau’s partnerships with the AmeriCorps program, local recreation programs and school districts have allowed the tennis program to visit different sites in the county each summer. The youngsters earned prizes like jump-ropes, hats, sunglasses and more for competing at different skill areas. They had to return a serve and try to get the ball to land in one of several circles on the opposite side of the net to win prizes; they also pummeled balloons on a wall during a speed measuring event. During the obstacle course, the youngsters had to control their tennis balls on their racquets as they navigated the route. A young lady spins as part of the obstacle course. They also had to run with a “tennis ball” to a bucket of water and then race back to their cups with the soggy ball and squeeze it out into the cup. The first to overflow their cup won the challenge. Several showed good tennis skills and some potential. “Off the top of my head, I’d say there were at least five that I noticed,” Evans said. “They all did pretty good. I would be surprised to see some of them on their school tennis teams in a few years. The carnival was a way to provide participants the chance to learn the basic skills of tennis and the thrill of competition while in a fun setting, according to Evans. 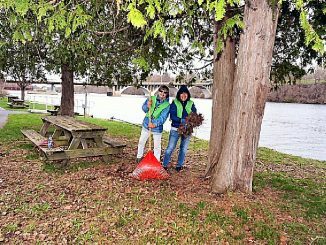 This year, two new AmeriCorps members helped coordinate the event, Ryan Maxson and Carlie Morley. Maxson, Morley and Evans spent the summer bringing the tennis program to 13 different sites, including various recreation programs and town parks, some of which didn’t have tennis courts. Two youngsters compete in the over-flow the cup challenge. 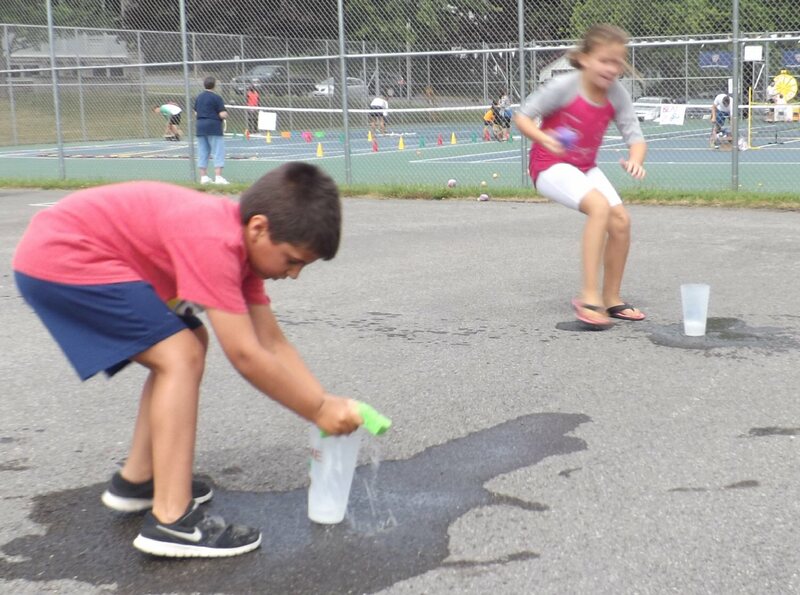 Some of the sites that they have traveled to this summer include Riley Elementary, Fulton Y, Camp Hollis, Hannibal Library, Camp Zerbe, Cleveland, Sandy Creek, Pulaski, Constantia, Granby, Fulton CYO, Schroeppel and the Fulton Parks. Where there wasn’t any tennis courts they set up some makeshift nets and had fun, Evans added.